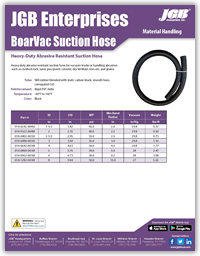 BoarVac Suction Hose - JGB Private Brand - Hose by Vendor - JGB Enterprises, Inc. Heavy duty abrasive resistant suction hose for vacuum trucks or handling abrasives such as crushed rock, sand, pea gravel, cement, dry fertilizer, iron ore, and grains. SBR rubber blended with static carbon black, smooth bore, corrugated O.D.